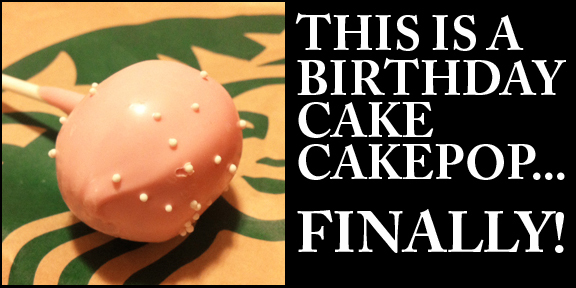 My Starbucks Birthday Cake Cakepop Quest is Over!!! Happy Monday Cupcake Lovers! So, you may or may not have read in an earlier blog post that I was on a mini quest to taste the Birthday Cake flavored Cakepop at Starbucks. As I mentioned in that post, there are several things I believe are in the “cupcake family,” like cakepops, cakeballs, doughnuts, muffins, etc., so to me this is an okay topic for this blog. When my quest began, I had already tried the Tiramisu flavor, but had heard that the Birthday Cake one was amazing and this weekend I FINALLY got to try it for myself! During my search, I was able to try both the Birthday Cake flavored doughnut and the Rocky Road Cakepop. As a reminder, The Rocky Road was really good, but the doughnut? Not so much. So what are my thoughts on the Birthday Cake Cakepop? It was good. I really did enjoy it, but I think that I like the Tiramisu the best. I guess it would depend on what mood I was in, but I think I would get the Rocky Road or Tiramisu before getting this one again. This entry was posted in Baltimore, Cake Pop, Maryland, Starbucks and tagged Cakepop, Starbucks, Starbucks Cake Pop by Stacy. Bookmark the permalink. I’ve tried the red velvet whoopie pie and so has a friend of mine. We both agreed that they were not very good. The carrot cupcake was delicious, though! the whoopie pie is awesome!! Now that there are mixed reviews, I’m really anxious to try it!